Free advanced Vipassana meditation booklet – the rarest Vipassana guide in the world! ‘In my possession is a tattered, yellowed booklet, the text is twenty-one pages long, written in 1961 by Phra Tepsiddhimuni (then Phra Rajsiddhimuni). 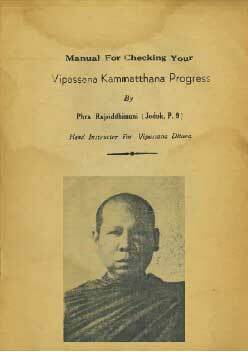 The commendable English translation by Thai volunteers in 1964 is entitled ‘Manual for Checking Your Vipassana Kammathana Progress’. Kammathana in Pali means ‘place of work’. 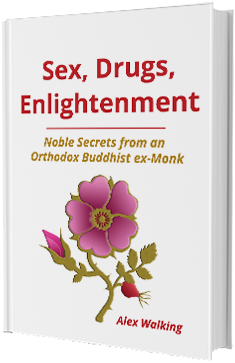 Here, it refers to the insight knowledges as stages of development or ‘places’ within the mind. The unofficial purpose was to introduce the Vipassana meditation technique to the world that the Mahasi Sayadaw, the Burmese monk who organised the council, learned from his teacher and had developed further. Any such method needed canonical support which was the Council’s job to scrutinise. A Council’s official endorsement is the bottom line in Theravada for acceptability. Phra Tep returned to Thailand to report to his superiors that through personal experience the method did indeed work and was validated by canonical analysis. Phra Tepsiddhimuni’s name changed several times throughout his life according to his advancing formal rank in the Thai clergy. His final name was Phra Dhamma Theerarach Mahamuni. His royally bestowed title of ‘The Meditation Teacher for all of Thailand’ remained constant. ‘For fun, I eventually took to calling Wat Mahadhatu “Vatican City-Bangkok,” due to its political significance as the traditional seat of the Thai national religion. It sits across from the Royal Palace, but the tourists never see it, although they can. For centuries, its abbots have been the Sangharajs, ‘Supreme Patriarchs’ in English, who are to Thai national church politics what the Popes in Rome are to Catholic government. Want Nothing; Fear Nothing: Be Free!